Daniel Bell was like any kid growing up in Australia, he wanted to play on the hallowed grounds of the AFL. As his journey began playing youth footy he was wearing a helmet for extra head protection. That ended when at the age of 15 he felt both out-of-place on the field with something many others were not wearing and his perception he (more specifically his head) was targeted due to the helmet. Now Bell is struggling to get through a day without issues related to head trauma. Earlier on Thursday, Bell said his motivation for raising the issue was to encourage clubs to embrace “brain training”, similar to the treatment he is receiving at Elite Minds, for players that suffer concussion. Colorado becomes the 13th state to require concussion training in youth sports. But unlike the majority of the other states that require training only for school-related athletics, Colorado would also include younger activities such as Little League baseball and Pop Warner football. Democratic Gov. John Hickenlooper planned to sign the training into law Tuesday. The Colorado legislation is named after Jake Snakenberg who lost his life after returning too soon from a concussion. This is something that we have addressed here on this blog, especially as it relates to Illinois. It is a good START to address a particular section of the youth playing sports, but it would be nearsighted to not include mechanisms for other student-athletes not participating in school sports, for what ever reason. Speaking of Illinois, HB200 that moved to the senate is now in the process of being melded with SB150 to include park districts, which is another step in the right direction. But Colorado has taken the lead on this, including younger participants and club sports is a MUCH better starting point. I am proud to be a Colorado Native, and hope that this will fall on the legislation of Illinois as well. Thanks to my mom for sending this along! The Concussion Blog has decided to take up another project, tracking the concussions of another collision sport, one with very good media coverage, albeit not in North America. Aussie Rules Football and its professional league AFL have had an issue with concussion in the past and as we have seen on videos here, they can be scary. With the help of Herald Sun we will be compiling the concussions on a weekly basis. Round 1 began with an announcement 48 hours prior to the opener about concussions, and without fail the season began with some high-profile injuries. The fan base in Australia is rabid for their national game, we are not so much, so I will be learning about the sport as we go along. We will see that there will be controversy as well with concussion decisions (see below). We would like to thank all that submitted letters on behalf of Athletic Trainers during the month of March. And for those that read and found out more about the profession, thank you. There is more than words out there… Remember to thank your local Athletic Trainer for all that they do. Ultimately, Dr. Neary would like to develop new diagnostic techniques that a trainer [athletic] or doctor could use in a dressing room and that would identify a concussion in a player like Pittsburgh Penguin star Sidney Crosby, who said he felt no symptoms after being blindsided in game on Jan. 1. Four days later, he was crushed against the glass by a Tampa Bay Lightning defenceman. He hasn’t played a game since. All of this research will lead to better awareness, detection and management. As we get nearer the playoffs there will be MANY more “undisclosed” or “upper body” injuries that will encompass the head. The general reasoning is the “old school” method of not letting the opponent know where to target. However, with rules in place to protect the head and hits that effect the head than listings like these are archaic in this authors mind. Granted that some reporters do not know about or want to speculate about injuries sustained, there are some obvious indications that, to me, get overlooked. Source: Boston Bruins’ Marc Savard has memory problems – ESPN Boston. Later today is the NHL Concussion Report, seven games remain and the league is nearing its high-water mark of 93 set last season. Yesterday I had the opportunity to attend the Association of Chicagoland Sports Physicians Concussion Update presented by AthletiCo, in Oakbrook Terrace, Illinois. I was invited by my medical director, along with our sports medicine physical therapist; the three of us went north to listen to three very good presentations, network and get ideas for our hospital (the food was also great). Heading in I knew the primary audience for this meeting was physicians MD and DO, in fact I believe that of the 70 or so people I think there were only 5 athletic trainers and 3 physical therapists. It seemed the room was evenly split between practicing physicians and residents, with some very knowledgeable and exceptional physicians in attendance. I was extremely encouraged to see all the “young” physicians willing to learn about concussions, some of whom didn’t even focus on Sports Medicine, but they wanted information. There were three presentations on the night; Chicago and Illinois legislation regarding concussions, Vestibular Rehabilitation for treatment of concussions and Point-Counterpoint of Neurcognitive Testing; possibly the three most poignant topics in the area. The number of concussions suffered by athletes increased 44.8 percent during that four-year period to about 190,385, from about 131,419. 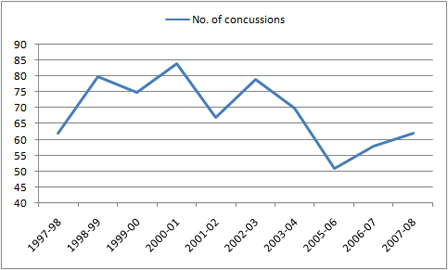 Concussion as a percentage of total injuries increased to 14 percent in 2009-2010, from 9.1 percent in 2005-2006. Yes, I know this is a blog devoted to concussions, however as an athletic trainer it is our job to educate the public about, well, pretty much anything associated with injuries in sports. With the increased attention on heart issues in sports, with some unfortunate deaths recently, I feel it necessary to disseminate this information. The American Heart Association is instituting changes to the way CPR is taught and performed. For the most part, these changes and clarifications were made to make it easier for anyone caught in an unfortunate situation of cardiac arrest. A lot of this was discussed back in October, as it was highlighted on various media outlets. As of April 1, these changes will be in effect for all instructors (yours truly included), meaning the way you once knew CPR is changing. The basic premise is “Quality Compressions: at correct depth with full recoil and at a rate of 100 beats per minute.” So for those of us that are trained what does this mean? The above changes were made to reduce “hands-off” time and increase the amount of compressions over time. The other aspect is that the latent time when using A-B-C and L-L-F was detrimental to survival and could have been a barrier for bystanders performing resuscitation efforts. The adult compression to ventilation is the same, as are the child and infant from the previous update in 2007. Not changed but continued to be emphasized was the need for early defibrillation, as this has become a key component to survival. Most public gathering spots now have AED’s, and their use is almost automated allowing even the most untrained person to use this device. As it relates to current events, it is unknown if AED’s were used in any of the cases. As mentioned there are other changes and points that the new guidelines provide, so the suggestion should be to get re-certified as soon as you can. And rather than wait the principal two-years for renewal, a yearly update may be good to stay on top of the new process. The AHA has plenty of exhaustive research to back up the changes, but it is really a common sense approach; lessening the down time and allowing anyone to perform chest compressions is a benefit. Hasbro Children’s Hospital of Rhode Island has put together three very quick, yet informative YouTube videos. As Florida moves concussion legislation through the houses, the Tampa Tribune put together this video highlighting the need for something to be done. 2011 NATM Tribute Letter: Paul LaDuke Jr. When concussions trickle into the classroom and “life”, what do we do? Well if you have read this blog long enough I trust that you know the answer. If you have not, or are a true skeptic about the lasting effects of a concussion, most prominently in the classroom of the adolescent individual perhaps you should read this article by Holly Klaft of Jackson Citizen Patriot seen on mlive.com. Bennett’s concussion occurred during a varsity soccer game against Northwest High School in September when he and an opponent both went up for a header. The other player came down on top of Bennett’s head, splitting it open. Bennett was treated and then went home. Dementia Pugilistica, otherwise know as chronic traumatic encephalopathy, has its roots in the Sport of Kings, boxing. Given that this sport and its derivatives; MMA, UFC, etc., goal is to inflict brain trauma there is surprisingly less heard about their dealings with concussions. There could be a lot of reasons why this may be; expected, inherent work condition, informed consent, less watched, or their general dealings with head trauma. Quietly, these sports and their sanctioning bodies have instituted some of the more strict rules when recovering from a knock out, or concussion. Generally each state and province sanctioning body has a “medical suspension” induced on a fighter that is KO’ed or even shows signs of a concussion, most are 30 days. Although specific wording in each groups medical suspension varies, the base of it provides that a fighter CANNOT fight for 30 days after the incident. Less commonly known is that this also includes sparring and training; however this clause is not in most rules, it is inferred. That is unless you are the UFC. We are down to only one NHL team that has not had a reported concussion. As of last week there were three; Carolina, Ottawa and San Jose. Carolina is the only team this season to not have a player concussed, and with generally 10 games remaining the Hurricanes have escaped thus far. What a great question that Greg Wyshynski wrote about at Yahoo! Former goalie and NHLPA executive Glenn Healy believes the new 15-minute-wait protocol either doesn’t consider goalkeepers or is simply unfair to teams who see their goalie suffer head injuries. To take the guesswork out of it for Heals, the Anaheim Ducks and Hiller have both been adamant that he’s suffering from vertigo rather than a concussion. Burrows received a five-minute major penalty for boarding and a game misconduct. Fiddler returned to the game less than 10 minutes later. Granted it appears that Cena has been medically taken care of, what needs to be noted is that if the WWE is basing return to ring solely on the ImPACT, they are setting themselves up for a problem. As we have and will highlight more, neurocognitive testing is a tool used in part with all other aspects of concussion management to make return to play decisions. Cena and the WWE would be best to keep him out of harms way until WrestleMania, as Rockwell suggests.